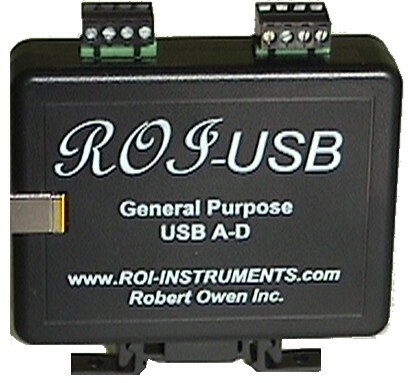 A simple USB Thermistor temperature measurement solution - Robert Owen Inc.
With ROI-USB read temperature real time, using a Windows PC USB port. With the ROI-USB, and Thermistor sensors bundled together; you can easily setup and customize your temperature measurement application, without having to spend time sourcing compatible components. 10K ohm NTC thermistor USB measurement system. Robert Owen Inc. provides a real time Thermistor Temperature Measurement Solution. With ROI-USB you can create real time data trending and analysis. Input data, from one or multiple ROI-USB’s. Create reports, charts and graphs in your spreadsheet, that automatically update with sensor data from your ROI-USB. Perform live analysis of your measurement data in your spreadsheet, with ROI-USB A-D’s & NTC Thermistor Temperature Sensors. Collecting temperature data with your computer is about as simple as it gets. Simple to use, can now be part of a custom data acquisition solution. PC powered by USB port temperature measurement. Useful for real time report generation, temperature trend plotting, and active temperature profile measurement.